This property has closed. The Innkeepers have retired. 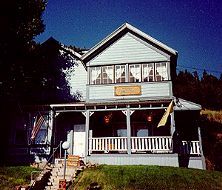 The Old Miners' Lodge is located in the national historic district of the colorful resort town of Park City, Utah. This charming bed and breakfast inn was established in 1889, as a boarding house for miners seeking fortune in Park City's ore-rich mountains. Today, the spirited warmth and hospitality of Park City's illustrious past remains in this building, which has been lovingly restored to its original splendor. Named for historic Park City personalities, the Lodge's 12 rooms and suites are restored and furnished to their period fullness. A full hearty breakfast is included, along with evening beverages. The bed and breakfast has outdoor hot tub welcomes back guests from a day of skiing (ski in), golf, tennis, horseback riding or hiking.